Jenny Brown entered a cake in a contest and was really happy to get second place. Who wouldn’t be, right? Well, the only entrant in the competition wouldn’t be, and that was exactly what happened: 2nd place prize as the only cake in the competition. The reason: the judges didn’t think that it was worthy of a blue ribbon nomination. It just wasn’t that good. Ouch! 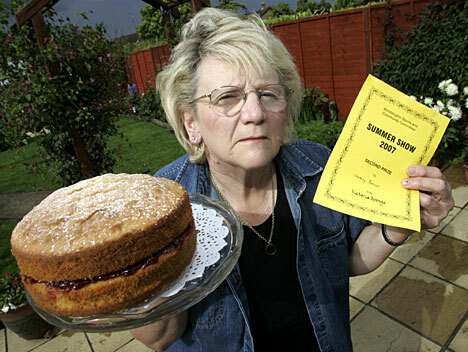 As it turns out, 11 years ago, she entered scones in another contest, was the only entry, and got third prize. She should just be happy to be moving up in the world. Read the whole story at The Daily Mail. oh man she is having a bad 11 years for the baking. I would actually quit if I kept getting shafted like that. But also who do those judges think they are judging the Iron Chefs come on she was the only entrant I’m guessing the town isn’t that big. Ahhh, it’s lunchtime now. I agree that she’s having a rough go at it. Maybe she should just buy her baked goods from the store from now on. Her poor family… No!!!! Not Gramma’s cake!! !